Yesterday was a bad day for the state of Florida. At the behest of Governor Rick Scott, the state forfeited more than $3 billion for a high-speed rail line connecting Tampa and Orlando. That money, and the 23,000 jobs it was expected to produce, will be transferred to other states — along with the opportunity to build a more modern and efficient intercity transportation option. Apparently when the Governor said that he wanted to “Make Florida the Job Creation Model for the Nation” he was just kidding. The truth is Scott has zero intention of providing any solutions that could serve as a model for the nation — and he is going to need those 20,000 jobs he just sent to California to dig him out of the hole he is burying himself in. How can he honestly claim that he favors job creation while making decisions that send tens of thousands of high paying construction and engineering jobs to other parts of the country? The traditional GOP economic lens, likely employed by Gov Scott when analyzing the cost-benefit of transit, is apparent in this report by the South Florida Business Journal, which notes that “…the state subsidizes Tri-Rail $34.6 million a year, while passenger revenue covers only $10.4 million of the $64 million annual operating budget.” Comparatively, we spend tens of billions of dollars on highway construction and maintenance, of which only a fraction comes from user fees and taxes. The economic boogeyman conservatives use against transit projects ignores the facts – we spend more than four times what we bring in from car user fees and taxes on highway projects, with diminishing returns on those investments on the land-use and development side. Despite Scott’s self-proclaimed “keen business sense,” his myopic focus on the economics of the initial HSR phase illustrates a clear lack of vision. 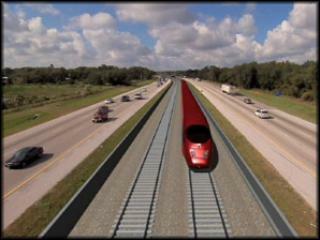 HSR is intended to be built out over multiple phases, with a second phase connecting Orlando with Miami. The economic vitality of the system is hinged on the completion of the network as a whole and not just the 84-mile segment linking Tampa and Orlando. Duh. Scott’s stated motivation, job creation, is all the more perplexing considering a recent study by Smart Growth America [PDF], which found that public investments in transit made under the American Recovery and Investment Act produced 70 percent more jobs than investments in highways. Elsewhere on the Network today: the League of American Bicyclists presents data on the number of new users attracted by investments in roads, transit and biking, respectively. Hard Drive explains Portland’s plan to create a “singing” bike lane, with special grooves that produce sonic feedback as cyclists pass. And Tucson Bike Lawyer highlights a campaign by a local developer seeking to overturn the city’s supposedly onerous bike parking requirements.